After the success of the 2010 work for stage, I partnered with Telecommunications and Film student Christian Coleman to film the work. Our film version was accepted to several film festivals. In 2012, it received its premier at the San Francisco Dance Film Festival. It was one of 25 selected out of 150 submissions from 20 different countries. Curator Margarita Savraki selected this work as one of 15 films highlighting dance in film for the 2014 Festival Miden, an international video arts festival. The festival is designed to promote international video art and new media art, in times dominated and defined by image and technology, creating a new, alternative, peripheral meeting point for emerging and established video and media artists from Greece and all over the world. Since 2005, Festival Miden has been gradually established as one of the most successful and interesting video art festivals in Greece and abroad and has been a significant point of cultural exchange for Greek, European and international video art. It was then selected for screening at A Tribute to Dance & Movement, at the Kalamata International Dance Festival, a branch of the Video Art Festival Miden, in 2015. In the frame of the 21st Kalamata Dance Festival, Festival Miden was invited to curate an open public screening with a selection of contemporary video art works on dance and choreographic movement. Works by international video artists from Festival Miden archives were specially selected for this event, jointly curated by Gioula Papadopoulou and Margarita Stavraki –founding members of Festival Miden – and Christiana Galanopoulou, artistic director of MIRfestival (Athens) & VideoDance festival (2000-2007, Athens & Thessaloniki) and collaborator of Kalamata International Dance Festival. Click here for the SFDF acceptance letter. Click here for press about the film. Click here for Kalamata Dance Festival program. This dance was a truly collaborative creative experience with my dancers, Lyndell T. McDonald (lighting and set design), Jason Vogt (set design), and Jordan Straight (costume design). 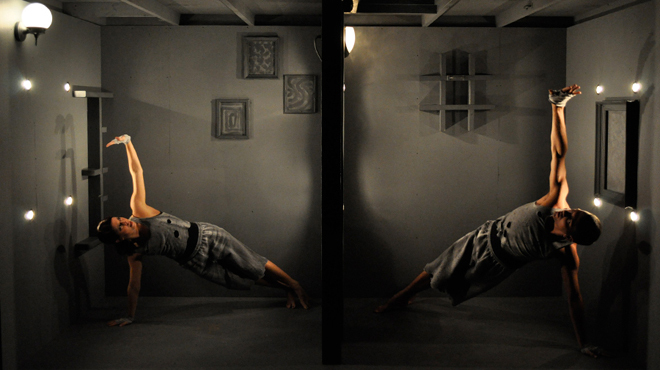 I worked very closely with my dancers to create the movement phrases dealing with issues of “confinement”. In the rehearsal process we developed movement phrases with each dancer contributing to various sections of the piece. 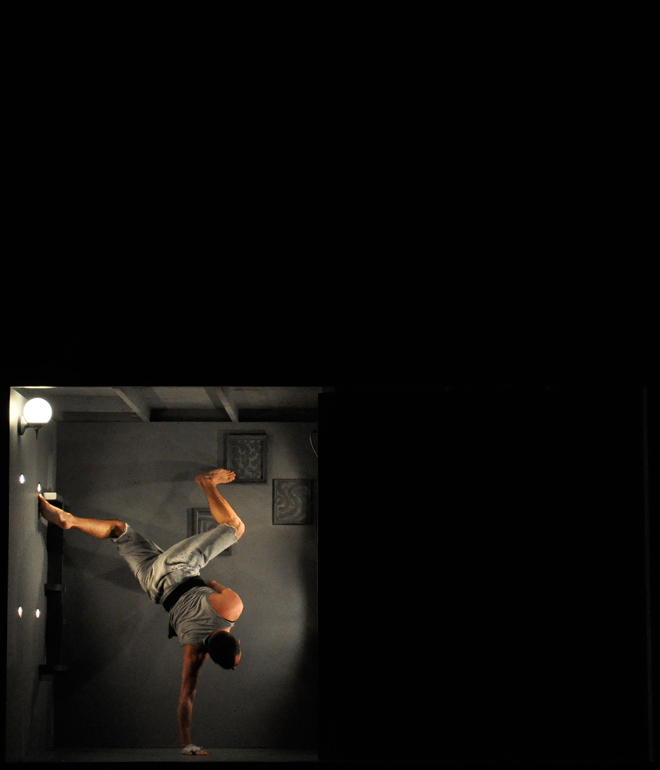 After an initial set design, we then worked with Lyndell and Jason to further develop the inside of the set so the dancers could interact with each “room” through the movement. This dance/theatre work was performed to great acclaim in our Fall 2010 ARDT concert. View the there, again photo book.